Washington (CNN) - It's been pushed off the radar the past couple of weeks by the 24/7 media coverage over whether Congress should authorize a military strike against Syria, but the bitter partisan battle over the new national health care law claws its way back into the spotlight on Tuesday. Proponents of the drive to defund the Affordable Care Act, better known as Obamacare, take to the West Lawn of the U.S. Capitol to hold an afternoon rally. A couple of hours earlier supporters of the law held their own gathering on Capitol Hill to push back against what they call Republican attempts to "sabotage" the health care law. The events come as the clock ticks down to key elements in President Barack Obama's health care law taking effect. Enrollment in the health care exchanges that form the core of the Affordable Care Act begins October 1, and members of Obama's administration have been hurriedly pitching the marketplaces to healthy young people, whose participation is necessary for rates to remain low. 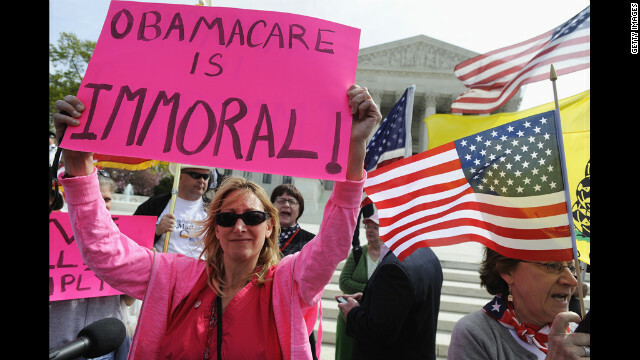 The rally to defund Obamacare was organized by two conservative groups, the Tea Party Patriots and ForAmerica, which last month held events across the country to pressure Republican members of Congress to join the push to defund the health care law. Three GOP senators who are leading the defund charge, Ted Cruz of Texas, Rand Paul of Kentucky, and Mike Lee of Utah, are all scheduled to speak at the rally. The three senators, as well as some other conservative lawmakers, are using upcoming budget battles as leverage, vowing to oppose any measure that provides funding for the federal government, including money for the health care law. The measure funding the federal government expires September 30, setting up another Capitol Hill budget battle between congressional Republicans and the White House. But so far only slightly more than a dozen fellow Republican senators have signed up to support the cause, leaving it up to outside conservative groups to rally the base. That's the purpose of Tuesday's rally, as well as other events by grassroots conservative groups, including a nine-stop series of townhalls held the past few weeks by Heritage Action, the sister organization of the Heritage Foundation, one of the oldest and largest conservative think tanks. "This fight is about backbone and we need some backbone up here, we need some help," Paul told the crowd. "We may not win the ultimate battle but we won't know unless we begin and fight the battle. I say fight on, don't give up, this battle can yet be won." House Republican leaders Tuesday introduced to the GOP rank and file legislation that would fund the government through mid-December. In an attempt to give conservative members cover and to secure votes, Republician leaders are also drafing a proposal that would be voted on alongside the funding bill. The separate measure would contain language preventing the administration from using any federal funds to implement the new health care law. A House vote on both these measures could come as early as Thursday. A senior House GOP aide admitted to CNN Monday night that the language on defunding Obamacare would be non-binding. "Listen, our goal here is not to shut down the government, " House Speaker John Boehner said at a briefing with reporters Tuesday after a closed-door policy meeting with Republican representatives. "Our goal is to cut spending and stop Obamacare. I believe that the strategy that was outlined to the members this morning accomplishes that." Asked about criticism from some Republicans that the suggestion of a separate vote on defunding the health care law seemed like a gimmick to appease conservatives, Boehner said "We've just initiated those conversations this morning. We'll be talking to those members as the day goes on." Both Boehner and House Majority Leader Eric Cantor were booed by many at the defund Obamacare rally. Preceding the anti-Obamacare rally was an event at the U.S. Capitol visitors center organized by two progressive groups, Americans United for Change and Protect Your Care, to "denounce GOP efforts to sabotage the health law and leave millions uninsured," according to a release. A handful of Democratic lawmakers were also attending the gathering. "We are going on offense on Obamacare. We are no longer sitting around and let Republicans kick a law that we know is going to work," said Americans United for Change president Brad Woodhouse. The battle over Obamacare and the new attempts to defund the law were generating headlines as Congress headed into recess in early August. Other than former President Bill Clinton's speech last week in defense of the measure, however, the story's been mostly pushed to the sidelines by the constant coverage of a possible U.S. military strike against the Syrian government for their alleged use of chemical weapons against its own citizens. - CNN White House Producer Kevin Liptak and CNN Producer Paul Courson contributed to this report. at least she got a spell checker for that sign. Wonder what the rest of the 'murkins have on theirs....? Someone wrote "Why are the Democrats not listening to the American people?" Well, the President ran in two elections on this issue and everyone knew his feelings about it and he WON! The last time he won by a lot. So the American people spoke loud and clear. The Supreme Court upheld the healthcare act. Were they wrong too? These people spout on and on about this issue as if they are the only ones who represent the 'American people". Perhaps they only represent a tiny portion of very greedy, uncaring, partisan Americans. How about that? Just to be clear, I do care about millionaires and billionaires from both sides of the aisle trying to bait one citizen against another citizen. That is all well and good, but what is their replacement? Have the replacement ready to go before dismantel the current law. Truth – why aren't republicans listening to the American people? "Why are the Democrats not listening to the American people? Who are they listening to?" What have the Democrats done to merit that accusation? The People's Congress is taking a vote on the issue. No action has been taken against Syria While the Republicans have calling for military action for the last two years, they want to pretend that their words were never uttered, especially by one Senator McCain. He made a secret visit to Syria to advocate arming the rebels, whom he didn't really know. – several large insurance companies have pulled out of the initial launch. – health extortion companies have already raised rates to neutralize alleged ObamaCare "savings"
– heavy taxes on medical technology to fund ObamaCare will translate into higher costs and will neutralize any alleged "savings" from ObamaCare. A new record. 100% incorrect. I find it immoral how much money insurance companies make. Insurance agents are not doctors , there used car salesman. The TEA Party is behind this? The suppossedly non-political, social service groups that want 501 c(4) not-for profit status from the IRS? I dunno, this seems pretty "political" to me. Do the Koch Brothers andDick Army really deserve "not for profit status"? No wonder it is wrong- on every front. Stupid people being lead around by their noses- wanting the middle class and the poor to be denied heath care. What creeps! Obamacare is a mess but it is better than nothing. The practice of the last 40-50 years of shoving unpaid hospital bills onto other people's bills has to stop. That is why a procedure I had in 2012, that has an average cost nationwide of $16,000 resulted in a bill for $57,000. My insurance company negotiated it down to $18,000, with me paying a $5,000 deductible. That other $29,000 was to cover unpaid bills run up by deadbeats, many of whom probably could have paid the bill or afforded insurance and even more probably could have made payments and paid their bill off in a couple of years rather than sticking it to me and every other patient who is responsible and/or has insurance. I agree with u on every statement u make. So on the lines of 501 (c) status the NRA needs 2 b questioned on their involvement n recalls n colo! "Obamacare combatants fight for attention"
Attention? Haha. Indeed. Go to Youtube. Search for "why throw a temper tantrum when no one is around?" That is all the explanation you will ever need for the Teatrolls. A few things to consider. UPS just dropped the Spouse Coverage from it's employee's benefits. IBM just transferred 110,000 retired health benefits to the exchanges. Time Warner did the same. You think that's the end of it? Obama Care is killing jobs. You don't think so? Good luck.